How much will student debt rise? Geoff Sharrock looks at possible impacts on student debt of fee deregulation. He concludes In at least some universities, it is fair to assume that deregulated fees may double or even triple in some fields, not suddenly but over time, with a significant impact on HELP debts. In others, fee rises and the higher HELP debts they create may well be quite modest after all. In an expanded analysis on the LH Martin website, Sharrock advises that universities and students should continue to oppose the severity of the subsidy cuts and the other risks the reforms pose for students. Education minister Christopher Pyne has released new public subsidy rates for domestic students in degrees offered by universities, to take effect from 2016. As a budget saving the government aims to lower the rate of public subsidy by 20% overall. 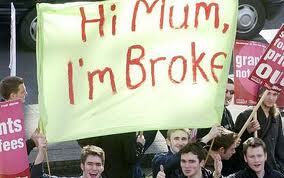 Most universities will raise fees to at least offset their loss of income from government subsidies. Many will go further to boost the total level of income they’d receive, above 2014 levels. Either way, Higher Education Loan Program (HELP) debts will balloon. Fee deregulation offers the flexibility sought by Group of Eight (Go8) vice-chancellors such as ANU’s Ian Young and UNSW’s Fred Hilmer, but opposed by others, such as the University of Canberra’s Stephen Parker and UTS’ Ross Milbourne. For Go8s especially, fee deregulation is almost a licence to print HELP debt. Given their high cost base and market leader power they’ll want to raise fees considerably, to finance their ambitions in teaching and research. This would also narrow the big gap (of 200% to 400% in many cases) between what their domestic and international students pay. Other universities with less market power have less scope to raise fees; some may have to live with lower income per student. Many already operate in thin regional markets, or crowded metropolitan ones. As more online degrees emerge (and subsidy rates may go yet lower for these) they will face more price competition from each other. Price competition will also come from non-university providers with new access to subsidies for their students, though at lower rates than for universities. The aim of this “Vegemite” policy is to lower the public cost of enrolment growth in an expanding tertiary sector, by spreading subsidies more thinly and more widely. For students the big question is: what will HELP debts look like for those commencing in 2016 compared with 2014? There are too many change factors at play to make firm predictions. But we can get some sense of this by comparing the student debt outlook today with a handful of post-2016 scenarios. First, the status quo. 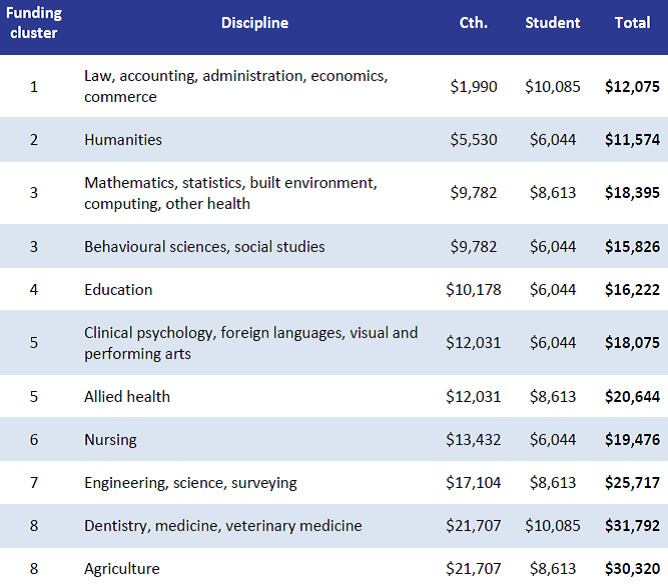 Table 1 shows the existing Commonwealth subsidy and student fee rates for different fields of study in 2014. Table 1. 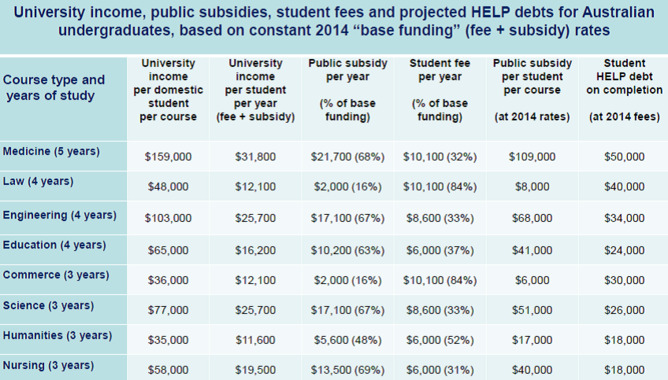 2014 subsidies & fees. In rough, round figures, Table 2 shows the 2014 funding model in action. It shows how much income a “typical” university receives per student in different courses, from fees and subsidies, at 2014 rates. It also shows the share of costs paid by students and taxpayers in each field. 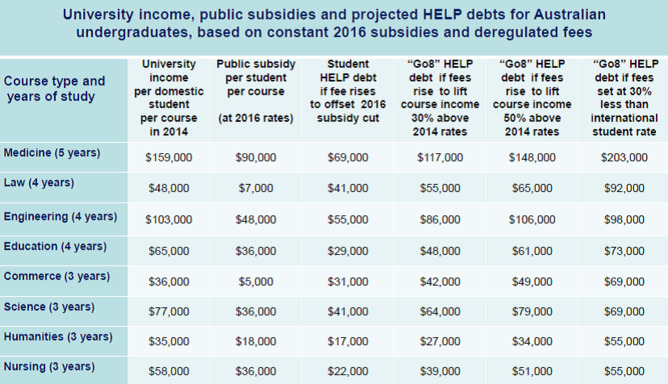 And it shows what HELP debts in each field would be after three to five years if fees stayed at the 2014 rate. As we’d expect, graduates in medicine face higher debts than those in education or the humanities, in part due to higher fees. On the other hand, taxpayers contribute far more to the cost of degrees in medicine than in those fields, and doctors can expect to earn more. Meanwhile, law graduates face higher debts than engineers or nurses; yet taxpayers contribute far less to law degrees. Over a lifetime, lawyers can expect to earn more than nurses. Defining a “fair go” on the costs and benefits of study is difficult. Table 3 shows the new subsidy rates that will apply in 2016. Now in new groupings, these don’t reflect an across-the-board 20% cut. No fee rates are shown, since in 2016 these will now vary across both fields and institutions. Table 4 shows four HELP debt scenarios, based on 2016 subsidy rates and deregulated fees. In the first scenario, universities raise fees just enough to offset the subsidy cut and maintain their total income per student per course at its 2014 rate. In the second, a “notional Go8” university raises fees enough to lift its total income by 30% compared with its 2014 income. In the third scenario fees are raised further, to lift total Go8 income per student by 50%. In the fourth, fees are set at a domestic student rate 30% below a “notional Go8 market rate” for international students. 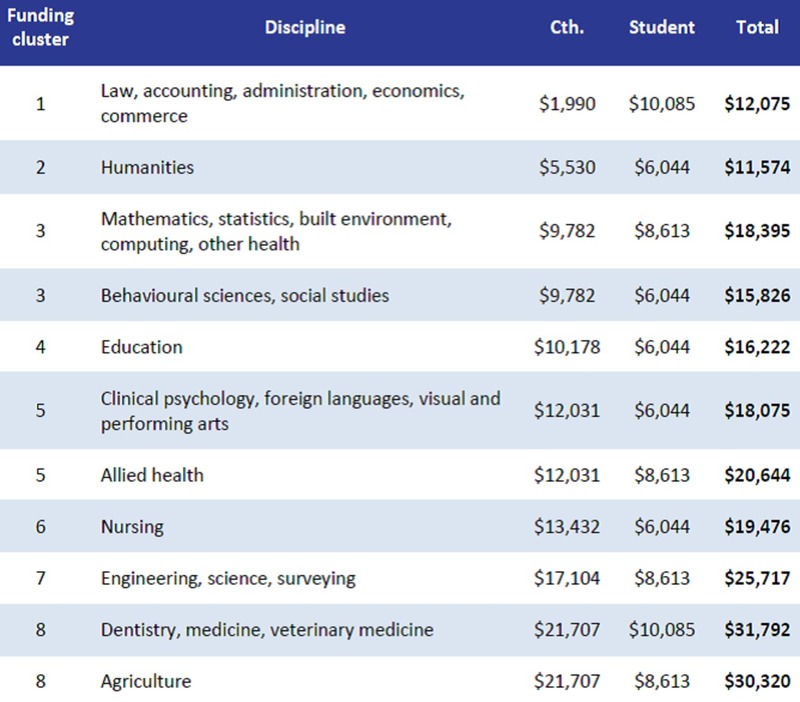 Based on a rough scan of international student fees in Go8 institutions in 2014, the “notional market rate” used here is A$58,000 per year for medicine, $35,000 for engineering, $33,000 for law, commerce or science, and $26,000 for education, humanities or nursing. This leads to higher HELP debts than the 50% scenario in all fields except for engineering and science. How plausible are these post-2016 fees and HELP debts? Generally, we can expect fees to rise more steeply in degrees with high private benefits and strong international demand, such as law and commerce. In high cost fields with lower private benefits and lower international demand such as nursing, this seems less likely. Overall these scenarios suggest that in some universities deregulated fees may double or even triple in some fields, not suddenly but over time. In others, fee rises may be modest, particularly in fields where credible online and non-university providers compete on price for students and subsidies. This article by Geoff Sharrock, University of Melbourne, was originally published on The Conversation.